Girly pinks and floral prints are my thing now. I think this has been the case since I found out I was having a girl. I received this super cute dress from PinkBlush and I love it! I really wanted to stick to a more feminine look since the dress already has cute ruffle sleeves and a ruffle hemline. 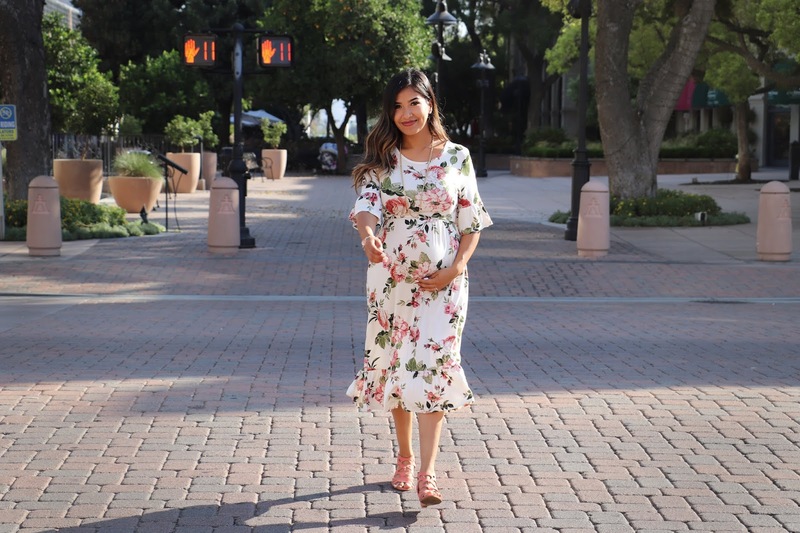 I paired this floral maternity dress with pink wedge sandals to achieve this look. Floral prints may seem a bit challenging, but they are practical because you can take the look in any direction. An edgy look can be achieved with some ankle boots and a moto jacket. You can never go wrong wearing white sneakers and a denim jacket for an everyday, casual look. 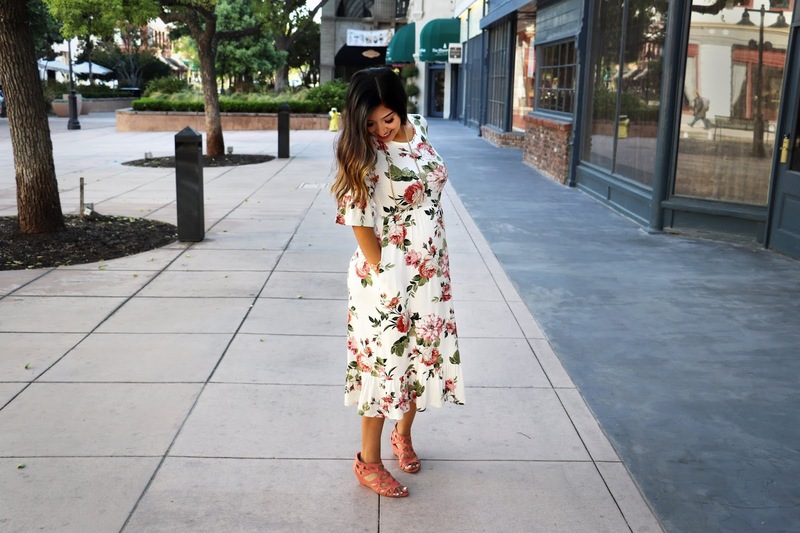 The fabric of this dress is really light and airy, which is perfect for summer! I can also picture myself wearing this dress for during the fall with a light jacket once the weather starts to cool. 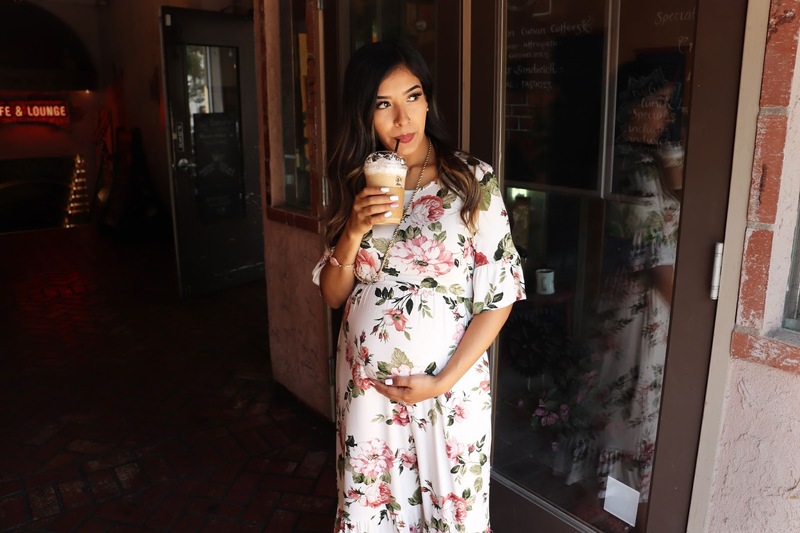 I love maternity dresses that can be worn after I have my baby, but that's not even the best part! Whoever designed this dress definitely had me in mind since I'm always hungry and I can keep my snacks within reach! No shame here! I love your dress.It really is so cute and looks great on your bump. 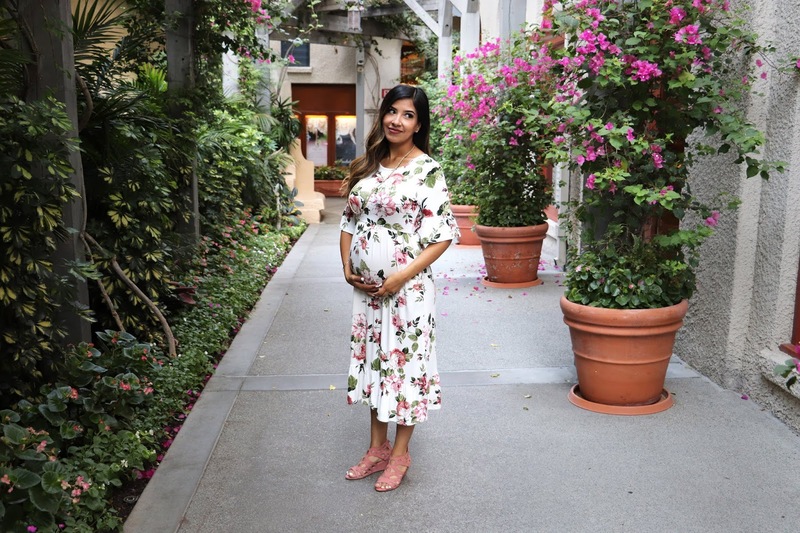 That is such a pretty floral dress and I agree you can definitely wear it after giving birth. You look radiant and happy, nice to see your blog. Oh, I love the idea that you started dressing more girly once you found out you were having a girl - that's so sweet :) This dress looks SO beautiful on you; you're such a natural beauty, wow!! Oh this dress is so pretty oon you!!! I love this look, that dress is so pretty and looks great on you! You look so beautiful! Love the floral dress.